Hartwood Acres is probably now best known for its Celebration of Lights, an event that consists of driving through the park at night to view an elaborate display of holiday lights (currently in operation, this year it is slated to run until Sunday, January 9, 2011). Donations are requested for cars traveling through the event (this year’s suggested donation is $12). For this event, visitors must enter via the Saxonburg Road entrance. The event begins at 6:00 PM every night and runs until 10:00 (on Fridays and Saturdays it runs until 11:00). Hartwood Acres also has a summer concert series that tends to boast a wide variety of acts; these events are held at the amphitheatre near the Middle Road parking lot. These concerts are free, and if memory serves, parking is usually expanded for these events (the Middle Road parking lot is not the largest area imaginable). 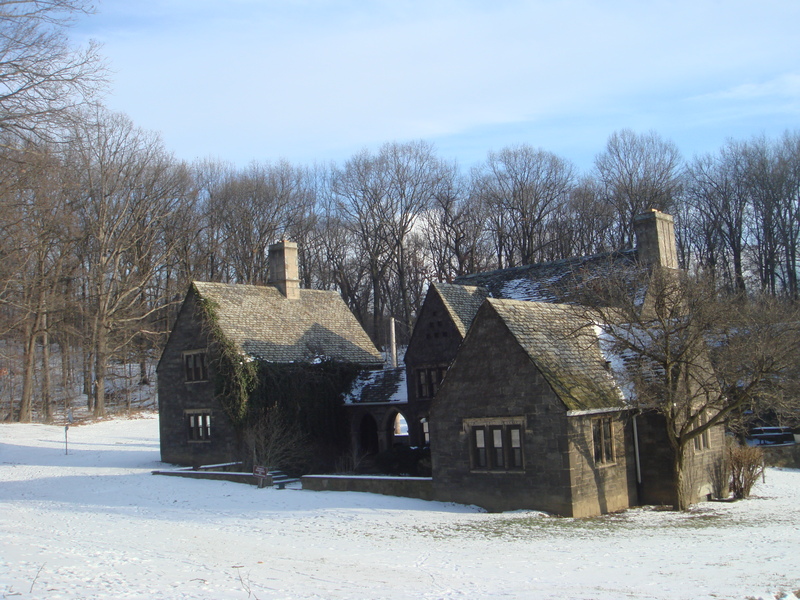 Although these events are the most publicized attractions that Hartwood Acres offers, the park also contains a lengthy network of trails that, due to their endless permutations, are nearly impossible to tire of. It doesn’t hurt that the trails are extremely well maintained. The official maps (yes, plural…more on this later) hardly hint at the number of connecting trails, side routes, detours, and intricate intersections one encounters when actually hiking the trails. Admittedly, this can be frustrating at first, but if one has an adventurous spirit and views the maps for what they are (a basic overview of Hartwood’s trail system), exploring the trails, blazed or not, can be highly rewarding. There are two (!) systems by which the trails are blazed; one is color-coded (with the traditional blazes on trees), while the other is numerical (consisting of numbered posts placed in the ground). In general, the color-coded trails are lengthy loops that can be begun at a parking lot and take the hiker back to where he/she began, while the numbered trails are shorter, one-way trails that must be combined with other trails in order to obtain a walk of any length. Occasionally, the signs and blazes will be ambiguously placed (this tends to occur most often where trails nearly loop back on themselves), which necessitates a degree of caution on the part of the novice Hartwood hiker…but eventually, one will develop a feel for the trails and be able to explore even the unblazed sections of the park without fear of getting lost. As a side note, the maps provided in various locations at Hartwood Acres itself are black and white and hence are more useful for the numerical system (although the color trails are indicated); if one is using the color-coded trails (which is strongly advisable for hikers unfamiliar with Hartwood), printing off a copy of the online map in advance might not be a bad idea. For beginners, I would advise staying away from the blue, white, and solid red blazed trails, simply because there are sections where they overlap in a confusing manner. Instead, try the solid orange trail (in the mansion area) or the red/white trail (accessible either from the road past the stage, or else from the stables; look near the unpaved road up on the hill). They are relatively easy to follow and offer up a flavor of what makes Hartwood so fascinating. The orange trail cuts through a series of impressive meadows and has sections that dip into miniature valleys and climb back up in a very tight space, making it a trail that can be enjoyed simply for its unpredictability. The red/white trail leads past the stables (as mentioned before), through several neat fields, and through an upper section that’s always filled with deer. Directions: There are two parking areas for Hartwood. One, off of Middle Road, is adjacent to Central Elementary School and is best for those who intend to stay on the roads or simply walk around the stage area. If one plans to explore Hartwood’s trails, it’s probably best to use the alternate parking lot, off of Saxonburg Boulevard (there is a large sign and three turns; it’s hard to miss). This lot is also near the mansion, which is open to tours; although there is a fee, the exterior of the building alone is entertaining enough to walk around and photograph, as are the surrounding gardens and hills. It’s not uncommon to see a wedding party having their photographs taken in the mansion area. From the mansion parking lot, it’s a fairly short walk to the stables or your trail of choice (only an intention to hike the solid yellow trail would really indicate a preference for the Middle Road parking lot). A few random closing notes…the trails are open to cyclists and equestrians (a little-known sign at one of the trail entrances states that pedestrians have to yield to equestrians and cyclists have to yield to everyone). If you aren’t ready for bona fide trails, Hartwood is full of paved roads that can take anywhere from half an hour to an hour to walk (depending on which path one follows in the concert area). Oh, and don’t be put off by the wealth of amusingly misprinted “Trail Closed Do (sic) To Revegetation” signs liberally sprinkled about the trail system. As far as I know, trails at Hartwood are never “closed,” merely redirected.